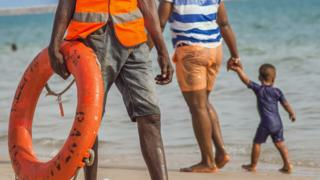 A new beach has opened to the public in Nigeria's main city of Lagos. 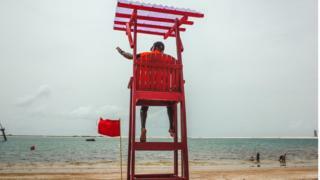 What marks this beach out as special is that it has paid lifeguards who watch over the Atlantic Ocean. 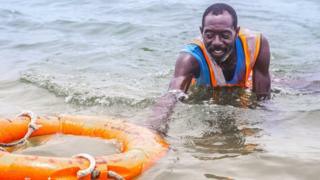 "The happiness is rescuing people so they do not die. 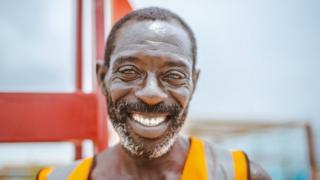 I am always happy because they come back to greet us and show appreciation," he tells the BBC. 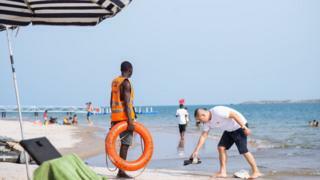 Many beaches in Lagos are privately owned - and this one in the upmarket area of Victoria Island charges 2,000 naira ($5.50; £4) a day for the privilege of swimming there. 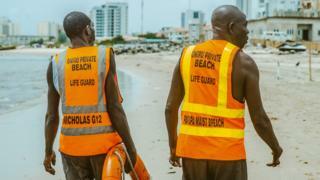 The three lifeguards all gratefully accepted the job at Landmark without knowing what their salary would be - although the beach management told the BBC it would be worth their while. 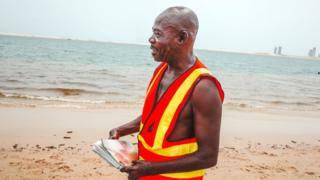 The 60-year-old says he would sometimes see dead bodies washed up on to beaches when he and the other fishermen came back with their catches - so he decided to become a volunteer lifeguard for his community's coastline. 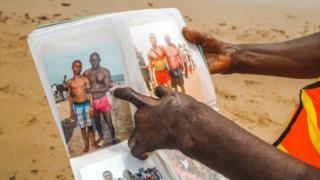 Mr Paul, who supervises the other lifeguards on Landmark Beach, says they play such an important role because "Nigeria's swimming culture is not good". 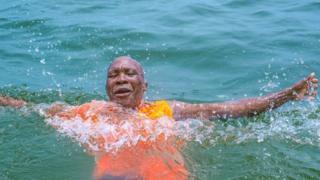 "Nigerians don't know how to swim but if you tell them to come out of the water, they will argue. I must monitor them from start to finish," he explains. 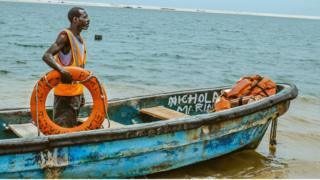 The former fisherman was given his job by Landmark Beach's management after his recent rescue of three Indian men who had got into difficulty. 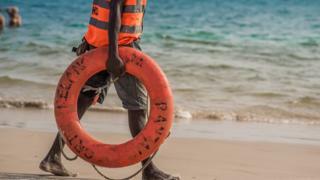 He says it would be good if the lifeguards were given better equipment - such as an emergency speedboat or bike, especially to rescue those who fall off water bikes in deeper water. 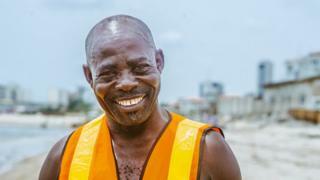 "When I came to the beach, there was nobody to assist so I volunteered. 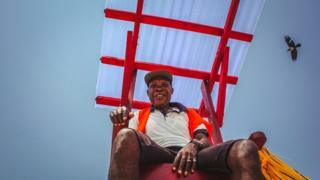 People know me here as 'Papapa'," the 65-year-old says. "Anyone I save, I know they will give me something." "My two children - someone is taking care of them for me," he says. "I love to save people." 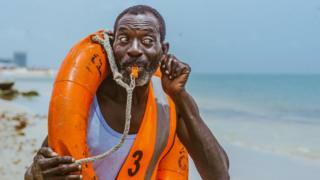 He too belongs to Mr Paul's lifeguard association, which hopes that other beach managers in Lagos will opt to pay a salary to those who save the lives of others.